Honoring the life of your loved one means you value the relationship you shared. We look forward to helping you determine how best to celebrate that connection and honor what made your loved one unique. We can make suggestions to enhance your ideas. Together we will create a fitting and memorable event. Contact us today to discuss all of the possibilities open to you. Your family photographs are skillfully blended with wonderful images and music, to create an elegant video. It can be an integral part of any type of time of sharing or memorial service. After the ceremony, the video is sure to become a treasured family keepsake. Additional copies may be purchased as gifts for family and friends. The traditional newspaper obituary is quickly being replaced by the memorial website. We’ve taken the concept further than anyone else. 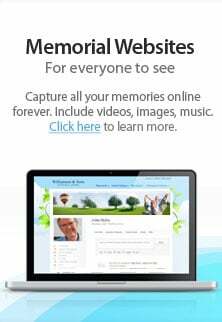 Our memorial site is not just a repository of family information, it can be a tool for connecting with family and friends, all in honor of your loved one. We invite you to take a tour, to see how it celebrates connections, honors life, and records the love you shared. You knew your loved one better than anyone else. We’ve got years of experience. Together, we can design the perfect memorial service, life celebration, or service of remembrance for your loved one. If you would like to consider the options, or simply have questions about our services, please call us at 888-273-3553 or send us an email inquiry. Again, if time is of the essence, please phone our office for more efficient and comprehensive discussion.